December’s chart, like other recent charts, signaled a break with the recent past. They have all actively supported reform and renewal and changed the political dynamic. In December, supportive and blocking aspects merged to engage us in soul-searching, ethical discussion and rational debate. This has led to reconciliations and realignments, large and small. December brought notable examples of such events. A major, if temporary, reconciliation: On December 10th, the US Congress announced a bi-partisan, 2-year budget deal allowing the government to keep functioning – for now. The deal also softened the effects of the sequester that had imposed damaging, across the board cuts, including painful cuts in important domestic programs. A return to principles: At about the same time as the budget deal, US banking regulators implemented the Volcker rule. It blocks commercial banks from speculating with depositor funds. The process of reconciliation is a two-edged sword, though. Alliances based on unsound moral principles and faulty reasoning broke down. Conflicts based on principles: “Establishment Republicans” are accusing Tea Partiers of pushing an unrealistic and destructive agenda to attract contributions. Tea Partiers are accusing Establishment Republicans of losing sight of conservative principles. December’s chart, like other recent charts, also had a lot of power behind it. December carried forward the karmic account settling of the eclipses in October and November. 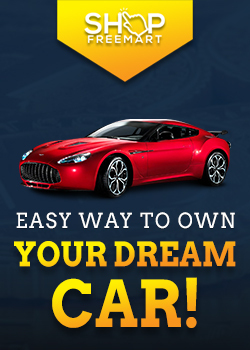 It is also driven by the considerable force of the 2013 Winter Solstice. 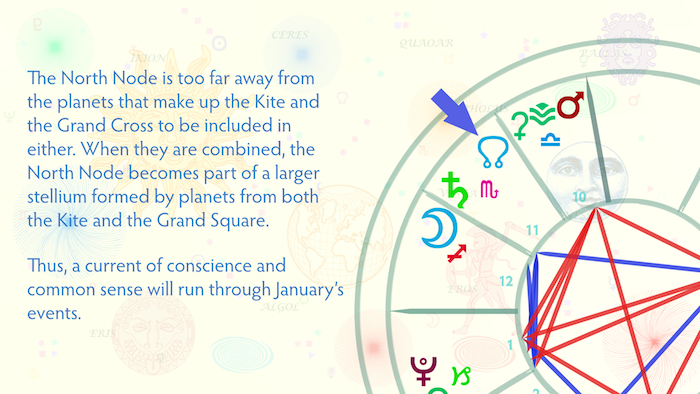 January’s chart, like December’s, also takes us in a new, and unexpectedly positive direction, and with surprising force. The last several years might lead us to expect yet another attempted power play by the 1% against the 99%, or another divisive political confrontation with the 99% on the losing end. Instead, January’s chart gives the 99% a leg up, and strongly supports inclusive dialog. 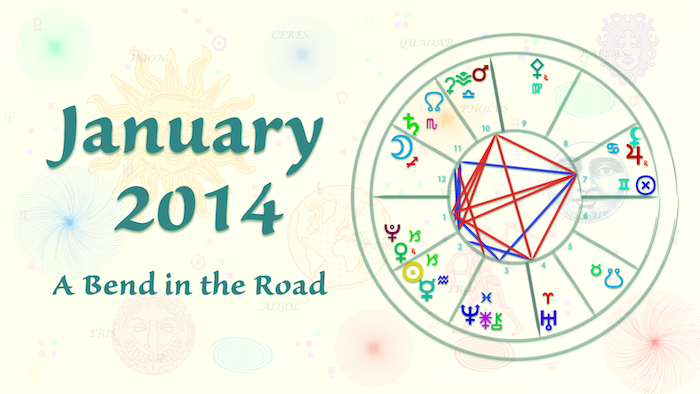 January’s chart maintains the strong, positive energetic momentum of recent months. Normally, we experience one Full Moon and one New Moon. In January 2014, there will be 2 New Moons and 1 Full Moon. The two New Moons will also be supermoons, which are not all that rare, but are intense. I believe this will supercharge put subconscious patterns in flux. When the energy is this high, it is especially difficult to see the order in or to predict events. The dominant aspects heighten the underlying intensity and volatility. January is a month with a lot of turns in it.January’s chart will will force important issues and block any false consensus or attempts to dodge important issues. The Sun is in the 2nd, Venus retrograde and Pluto in the 1st; all are in Capricorn. Uranus is on the cusp of the 4th in cardinal Aries. Jupiter and Lilith are conjoined in Cancer in the 7th house, near the 8th house cusp. Mars is in Libra in the 10th. One of the oppositions in the body of the Grand Cross is between Uranus and Mars. It affects the vertical, power axis. 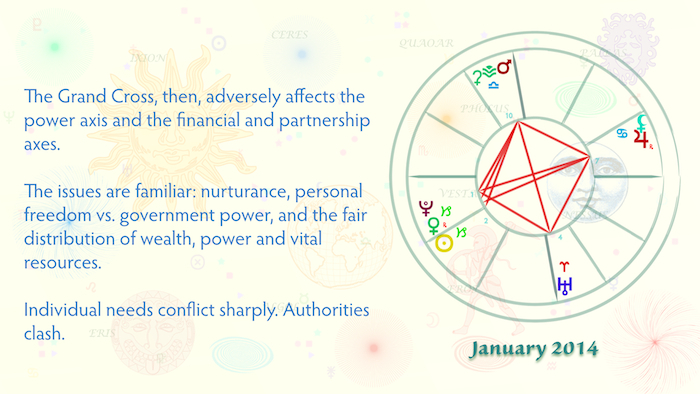 The second opposition is between Pluto/Venus and Jupiter and affects both the relationship and the financial axes. 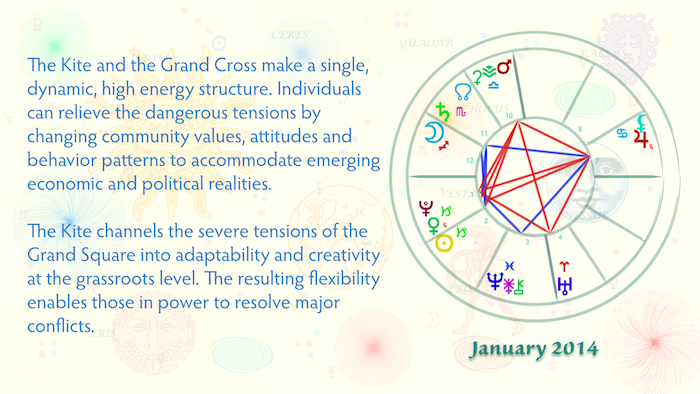 The Grand Cross, then, adversely affects the power axis and the financial and partnership axes. It will put a serious strain on those exercising power and on relationships, especially where these involve shared financial resources. The issues are familiar: nurturance, personal freedom vs. government power, and the fair distribution of wealth, power and vital, shared resources. Individual needs conflict sharply. Authorities clash with each other and with those under them. Governments are in conflict with those they govern. The cardinal signs and angular houses require decisive, yes or no, up or down decisions. The hard aspects make such decisions almost impossible without significant change.Compromise and half-measures, the usual means of avoiding conflict, won’t do in January 2014. The situation is volatile and frustrating. However, the outcome will differ from what we have come to expect. The aspect that offers the needed flexibility is a Kite, firmly rooted in the houses governing our identity, our personal lives and relationships in the community. Saturn in Scorpio and Moon in Sagittarius straddling the cusp of the 12th. An opposition between Pluto and Venus retrograde in Capricorn in the 1st and Jupiter in Cancer forms the backbone of the Kite. All of these placements positively affect the individual and the grassroots generally. The Kite links the 1st house of the individual to the 11th house of philanthropic and community organizations, and the 3rd house of community relationships. The individual acting as a member of the community – not the individual per se – is empowered. 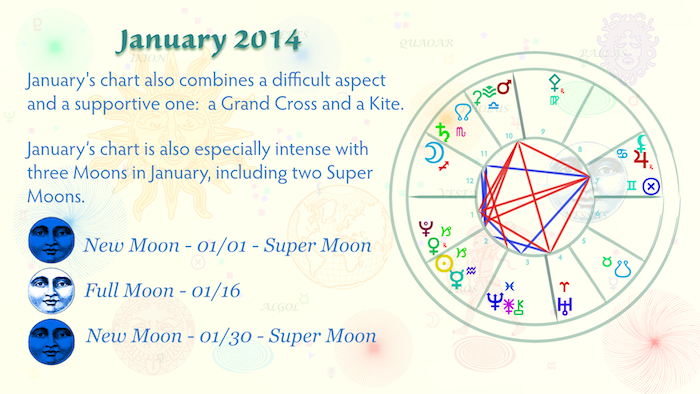 The Kite and the Grand Cross form a single, dynamic, high energy structure. Individuals can relieve the dangerous tensions in the Grand Cross by changing community values, attitudes and behavior patterns to accommodate emerging economic and political realities – in a principled way. The Kite channels the severe tensions of the Grand Square into adaptability and creativity at the grassroots level. The resulting flexibility should enable those in power to begin resolving major conflicts. January’s chart, again, leads to thoughts of yet another confrontation between the 1% and the 99%, with the 99% on the losing side. Individuals, acting as members of their community, have the upper hand, however. Personal and community preferences will figure strongly in any outcome. Listed below are a few individual placements that illustrate and reinforce the themes in January’s chart. The North Node is in Scorpio (the Sign of collective wealth and power) in the 11th house, in the home of Aquarius, the house of sharing and brotherhood. The North Node is too far away from the planets that make up the Kite and the Grand Cross to be included in either. When they are seen as part of a single, combined structure, the North Node becomes part of a larger stellium formed by planets from both the Kite and the Grand Square. Thus, a current of conscience and common sense will run through January’s events. Pluto in Capricorn in the 1st closely trines Pallas retrograde in Virgo in the 9th. Changes in subconscious thought patterns are surprisingly subtle and rapid, all the more so because of the three Moons in January – two of them supermoons. Mercury in Aquarius in the 2nd sextiles Uranus in Pisces in the 4th, near the IC. Innovative discussions on financial issues are driven by changes in home and family. The Part of Fortune conjoins the Descendant precisely. We are rewarded for creating relationships that accommodate change and also fulfill community needs and expectations. 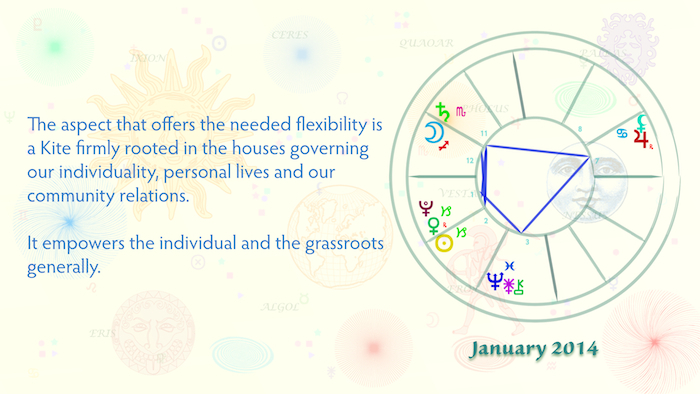 Neptune, Juno and Chiron are conjoined in Pisces in the 3rd house. Juno governs state-sanctioned life-partnerships, like marriage. It is flanked on one side by a powerfully placed Neptune, which dissolves, spiritualizes and transforms what it touches. It is flanked on the other by Chiron, which breaks boundaries and destroys limitations. Transformative influences now affecting marriage will peak – again. 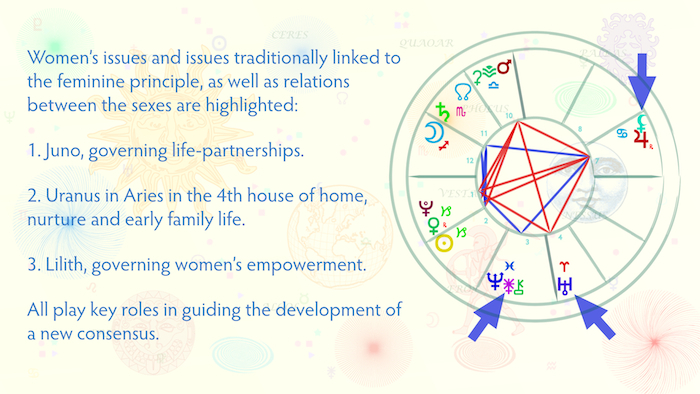 Uranus is in Aries powerfully placed in the 4th house of home and family life. The forces of change surge through our homelife and our family relationships. Lilith is in Cancer, which governs the home and family, on the cusp of the 8th house, which governs collective resources. Lilith governs the empowerment of women and the feminine in general. This placement indicates a new stage in the political and economic empowerment of women and the rising importance of family issues. The charts of November, December, and now January, mark a bend in the road. The past is disappearing from view. That past will not only lose its grip on our lives, but also lose its hold on our attention. We are leaving crisis consciousness behind for a new focus on rebuilding and renewal. We can already see this happening. Using the so-called filibuster, the GOP had blocked Obama’s appointments pretty much since the beginning of his presidency. Countless influential government posts have gone unfilled, preventing the implementation of new policies and programs. Numerous judgeships have remained vacant, weakening the court system and leaving outdated judicial philosophies in place, preventing relief through the courts. In December, the US Senate limited the use of the filibuster. As of now, a wave of new Obama appointees are being approved, breathing new life into stagnant government agencies and the US judicial system. As these new appointees step into their positions, a wave of change will flow through the country. That is only one example of the kind of thing we can expect to see in January and the months following.It should be emphasized that the personal, psychological, political and economic changes January sets in motion will not be completed in a day, or in a month. We are talking about the emergence of a new era governed by a more constructive dynamic than the one just behind us.